Kathryn received her BA in 1974 from the University of the South in Sewanee, Tennessee where she majored in Fine Art and English. She has had subsequent studies at The Arkansas Arts Center in Little Rock AK, The Arts Student League of New York in New York, NY and The New Orleans Academy of Fine Arts in New Orleans, LA. Her early work can be classified as narrative in nature focusing on themes of myth, family-life, birth and death. In her late forties she began working exclusively from life, continuing to draw inspiration from her surroundings, family, and location. Over the past twenty years she has focused on landscapes, cityscapes, interiors, and portraits, continuing to develop her narrative, figurative, and landscape work. She paints in Oil and Watercolors. She has shown throughout the south, in New Orleans, Louisiana, Charlotte, North Carolina, Atlanta, Georgia, Louisville, Kentucky, Lafayette, Louisiana, El Dorado, Arkansas, Savannah, Georgia and Bay St Louis, Mississippi. She recently had a one-person museum show at The Alexandria Museum of Art in Alexandria, LA. Her work was also recently featured in Louisiana Vistas Magazines, Where is Louisiana Art. She has upcoming Museum shows at The Zigler Museum of Art in Jennings, Louisiana and in 2020 at The Meadows Museum of Art in Shreveport, Louisiana. Kathryn’s work is currently represented by Le Mieux Galleries in New Orleans, Louisiana, Moremen Gallery in Louisville, Kentucky and The Elder Gallery of Contemporary Art in Charlotte, North Carolina. In addition to her work being shown throughout the south, Kathryn’s work has also been included in shows out west in Santa Fe, New Mexico and in the northeast in New York City. Her shows have consisted of landscapes, cityscapes, portraits and interiors. She presently resides in Alexandria, Louisiana and New Orleans, Louisiana with her husband Scott Anderson. She has three children, Rachel, Jesse and Hannah. 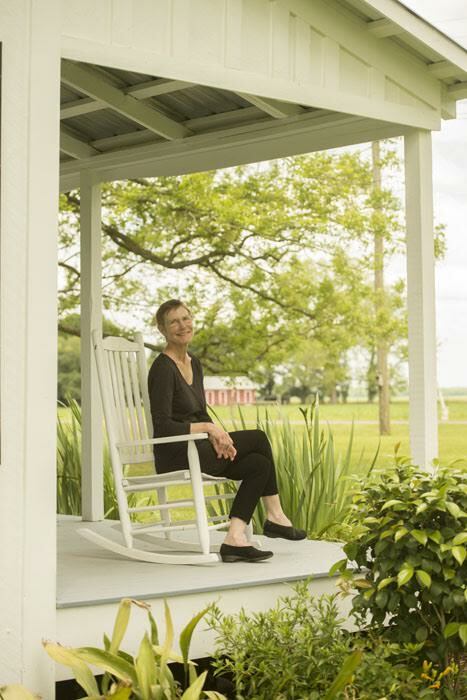 She is currently focused on a series of landscapes of the farm on which she lives in Central Louisiana. She continues to paint everyday from wherever she is in the worlds.